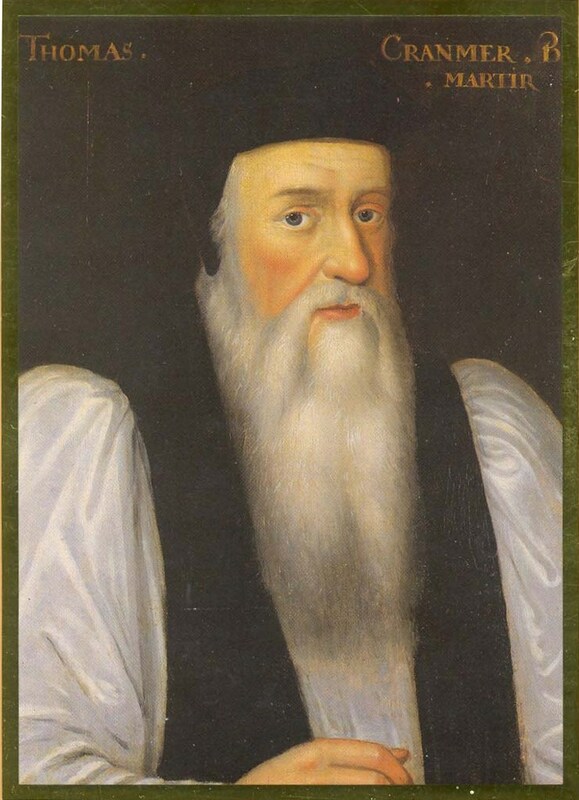 Archbishop Cranmer, the great church reformer and martyr, was born in Aslacton, in the parish of Whatton, in 1489 and became, in 1532, the first Protestant Archbishop of Canterbury. The site of Aslacton manor house was the seat of Archbishop Cranmer, and many of his ancestors. Near it may still distinctly be traced several moats, islands and other remains of the pleasure grounds, and at a short distance is a raised walk which leads to Orston, and is yet called Cranmer's Walk. At the west end, on crossing a moat, the visitor may ascend a square mount of considerable elevation, and from thence have an extensive prospect. Here are also two other mounts, said to have been raised by the Archbishop, but they have been greatly reduced by some of the former owners of the estate. On one of them, tradition says, the Archbishop "was wont to sit and survey the surrounding country, and listen to the tuneable bells of Whatton". The church, which Adelina de Whatton gave to Welbeck Abbey, is dedicated to St John of Beverley. It has a handsome tower and spire with five bells, and contains many ancient monuments of the Whatton, Newmarch, Cranmer and other families. Leland speaks of Aslacton and the ‘heire of the Cranmers’, the Archbishop’s elder brother, and it would be to his house that the martyr resorted when visiting the neighbourhood. He had, however, some property here, as appears by an entry in the State Papers, dated 1528, five years prior to his elevation to the episcopal bench. In the parish registers are various entries of the baptisms and deaths of members of the family. Ralph Morice, the private secretary of the Archbishop, has left behind him some interesting notes of his eminent master, in which he gives colour to the belief that the first of the family to settle in this country came into the realm with William the Conqueror. Prior to their appearance in Nottinghamshire they lived at Lutterton, and occupied a good position there. By the marriage of Edward Cranmer with the heiress of the Aslocktons they assumed the arms of the latter. Thomas Cranmer married Agnes, daughter of Laurence Hatfield, of Willoughby, Notts, and resided at the old manor-house at Aslockton. Their second son became Archbishop, and though we do not know much of his youthful days a few details have been collected in Strype’s ‘Memorials’. Whether the future Archbishop was educated by the parish priest, or whether he went to a grammar school in any of the towns of the neighbourhood, is a matter of speculation. Morice says that when he went to Cambridge he left ‘a grammar school’ to go there. But if not trained at home in literature and the arts, he received in the open fields of this broad stretch of country what was of great importance to him in after-life, an efficient knowledge of outdoor exercises and pastimes, and the foundations of a strong constitution. ‘His father used him to shoot with the long-bow, and let him hunt and hawk and ride rough horses’. Shortly after the funeral of his father at Whatton, in 1501, his mother sent him at fourteen years of age to Jesus College, Cambridge. His subsequent career is a matter of general history. He had soon after to vacate his fellowship, owing to his marriage to 'Black Joan', a relative of the landlady of the Dolphin Inn, and that he was reinstated in it on the death of his wife, which occurred in childbirth before the lapse of the year of grace allowed by the statutes. During the brief period of his married life he held the 'appointment of lecturer at Buckingham Hall', now Magdalene College. The fact of his marrying would seem to show that he did not at the time intend to enter the church; possibly the death of his wife caused him to qualify for holy orders. He was ordained in 1523, and soon after he took his doctor's degree in divinity. Cranmer continued at Cambridge filling the offices of lecturer in divinity at his own college and of public examiner in divinity to the university. It is interesting to know, in view of his later efforts to spread the knowledge of the Bible among the people, that in the capacity of examiner he insisted on a thorough acquaintance with the Holy Scriptures, and rejected several candidates who were deficient in this qualification. In Aug 1529 the sweating sickness, which prevailed throughout the country, was specially severe at Cambridge, and all who had it in their power forsook the town for the country. Cranmer went with two of his pupils named Cressy, related to him through their mother, to their father's house at Waltham in Essex. Henry VIII happened at the time to be visiting in the immediate neighbourhood, and two of his chief counsellors, Stephen Gardiner, Secretary of State, afterwards Bishop of Winchester, and Edward Fox, the Lord High Almoner, afterwards Bishop of Hereford, were lodged at Cressy's house. Meeting with Cranmer, they were naturally led to discuss the King's meditated divorce from Catalina De Aragon. Cranmer suggested that if the canonists and the universities should decide that marriage with a deceased brother's widow was illegal, and if it were proved that Catalina had been married to Prince Arthur, her marriage to Henry could be declared null and void by the ordinary ecclesiastical courts. The necessity of an appeal to Rome was thus dispensed with, and this point was at once seen by the King, who, when Cranmer's opinion was reported to him, is said to have ordered him to be summoned in these terms: "I will speak to him. Let him be sent for out of hand. This man, I trow, has got the right sow by the ear". 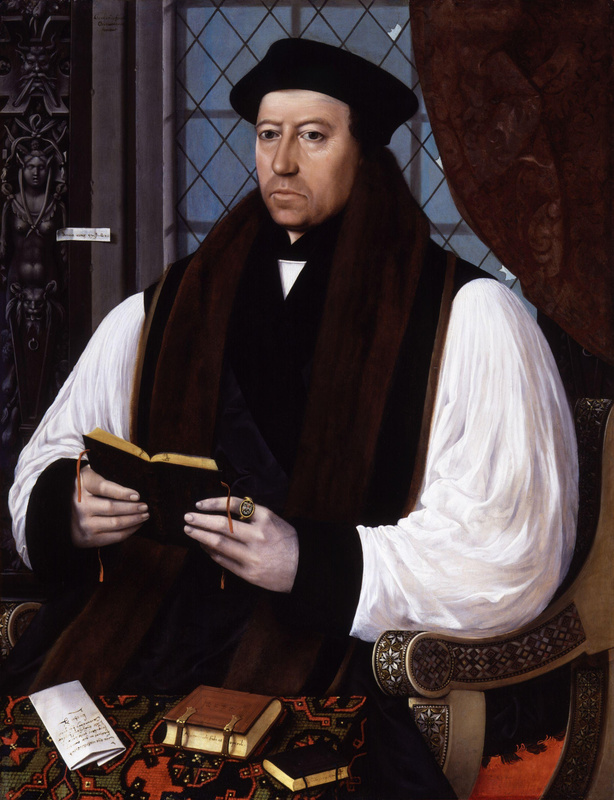 Thomas Cranmer defended the position that Henry's marriage to Catalina De Aragon was null and void, collecting opinions in his favor from the universities. Cranmer was commanded by the King to draw up a written treatise, stating the course he proposed, and defending it by arguments from scripture, the fathers and the decrees of general councils. His material interests certainly did not suffer by compliance. He was commended to the hospitality of Thomas Boleyn, Earl of Wiltshire, in whose house at Durham Place he resided for some time; the King appointed him archdeacon of Taunton and one of his chaplains; and he also held a parochial benefice, the name of which is unknown. When the treatise was finished Cranmer was called upon to defend its argument before the universities of Oxford and Cambridge, which he visited, accompanied by Fox and Gardiner. Immediately afterwards he was sent to plead the cause before a more powerful if not a higher tribunal. An embassy, with Wiltshire at its head, was despatched to Rome in 1530, that "the matter of the divorce should be disputed and ventilated", and Cranmer was an important member of it. He was received by the Pope with marked courtesy, and was appointed "Grand Penitentiary of England", but his argument, if he ever had the opportunity of stating it, did not lead to any practical decision of the question. Cranmer returned to England in Sep 1531. In the summer of 1531 he accordingly proceeded to Germany as Henry VIII’s ambassador to the Emperor Carlos V. He was also to sound the Lutheran princes with a view to an alliance, and to obtain the removal of some restrictions on English trade. At Nuremberg he became acquainted with Andreas Osiander (b. 1498 - d. 1552), whose somewhat isolated theological position he probably found to be in many points analogous to his own. Both were convinced that the old order must change; neither saw clearly what the new order should be to which it was to give place. Osiander's niece, Margaret, won the heart of Cranmer, and in 1532 they were married. Since Osiander's name is also given as Hosmer, Hosemann, and Heiligmann, Margarete's name was long given as Hosmer. Her parents names seem to be lost to history, but she was the niece of Osiander's wife, Katharina Preu and her last name was either Preu or Hetzel. In Aug 1532, Archbishop Warham died. Expected or not, the primacy was forced upon him within a very few months of his marriage. The King almost immediately afterwards intimated to Cranmer, who had accompanied the Emperor in his campaign against the Turks, his nomination to the vacant see. Cranmer's conduct was certainly consistent with his profession that he did not desire, as he had not expected, the dangerous promotion. He sent his wife to England, but delayed his own return in the vain hope that another appointment might be made. The papal bulls of confirmation were dated Feb and Mar 1533, and Cranmer was consecrated on 30 Mar. The elected archbishop took two oaths, the first episcopal loyalty to the Pope, and the second acknowledging the royal supremacy. The latter was so broad in scope that could be done enough to replace the old, to the extent that the two were incompatible. Cranmer, however, was not satisfied with this. There was a special recorded protest, which formally declared that he swore allegiance to the Pope only to the extent that was consistent with his supreme duty to the King. Cranmer wrote a letter to the King, praying to be allowed to remove the anxiety of loyal subjects as to a possible case of disputed succession, by finally determining the validity of the marriage in his archiepiscopal court. There is evidence that the request was prompted by the King, and his consent was given as a matter of course. Queen Catalina was residing at Ampthill in Bedfordshire, and to suit her convenience the court was held at the priory of Dunstable in the immediate neighbourhood. Declining to appear, she was declared contumacious, and on 23 May the archbishop gave judgment declaring the marriage null and void from the first, and so leaving the King free to marry whom he pleased. The Act of Appeals had already prohibited any appeal from the archbishop's court. Five days later he pronounced the marriage between Henry and Anne - which had been secretly celebrated about the 25 Jan 1533 - to be valid. On 1 Jun he crowned Anne as Queen, and on l0 Sep stood godfather to her child, the future Queen Elizabeth. His position as chief minister of Henry's ecclesiastical jurisdiction forced him into unpleasant prominence in connexion with the King's matrimonial experiences. In 1536 he was required to revise his own sentence in favour of the validity of Henry's marriage with Anne Boleyn; and on 17 May the marriage was declared invalid. With Anne's condemnation by the House of Lords, Cranmer had nothing to do. He interceded for her in vain with the King, as he had done in the cases of John Fisher, Thomas More and the monks of Christchurch. In 1537, he was the godfather of Prince Edward, the first legitimate son of King Henry. Wives were not at that time permitted for priests, let alone archbishops, so Cranmer hid his marriage. According to a story invented by the author of Bishop Cranmer’s Recantacyons (1556), the wife of Thomas Cranmer, was smuggled into England in a crate. Around 1540, Cranmer sent Margarete back to Germany to avoid prosecution, but she was able to return c. 1544. Cranmer was strongly influenced by the German Reformation. With his friend Thomas Cromwell, he endorsed the translation of the Bible into English and was influential in procuring a royal proclamation (1538) providing for a copy in every parish church. In 1538 an embassy of German divines visited England with the design, among other things, of forming a common confession for the two countries. This proved impracticable, but the frequent conferences Cranmer had with the theologians composing the embassy had doubtless a great influence in modifying his views. Both in parliament and in Convocation he opposed the Six Articles of 1539, but he stood almost alone. He promoted Henry’s marriage (1540) to Anne of Cleves, but his share in the divorce was less prominent than that of Bishop Gardiner, though he did preside over the Convocation in which nearly all the dignitaries of the church signified their approval of that measure. In 1542 Cranmer was one of the accusers of Catherine Howard. Mary Lascelles brought the new Queen's past to the attention of Thomas Cranmer. Mary had wed a man named Hall and was living in Sussex. When John Lascelles, suggested his sister that she use her old acquaintance with Catherine to obtain a post at court, Mary refused, telling him that Catherine was “light, both in living and conditions”. When she provided further details, Lascelles, a dedicated reformer, felt compelled to repeat what she had said to Cranmer. Cranmer shared the information with Lord Audley and Edward Seymour, Earl of Hertford. The King and Catherine were in the Chapel at Hampton Court Palace preparing for the service when Henry VIII is requested by Archbishop Cranmer for an audience. The King was not pleased at being interrupted and was shown papers to prove the case on Catherine's previous involvements and that she was still seeing Thomas Culpepper privately. Cranmer certainly could have welcomed this process as he could use it to his own end as Catherine was a Catholic and very much favoured by Princess Mary. Therefore on the morning of 4 Nov 1541 he sought to carry out his order from the King to obtain a testimony from Catherine and Lady Rochford. This Catherine knew and therefore did intend signing a declaration clearing her name. Lady Rochford was also informed by Cranmer if she could prove the guilt of Catherine then her own life would be spared. Intrigue was happening all around Catherine and unfortunately she was without any support from family or friends. Any she had disappeared very quickly for fear of incrimination. Catherine was in the perfect situation to be dealt a fatal blow without even seeing it coming. The course taken by Cranmer in promoting the Reformation exposed him to the bitter hostility of the reactionary party or "men of the old learning", of whom Gardiner and Bonner were leaders, and on various occasions — notably in 1543 and 1545 — conspiracies were formed in the council or elsewhere to effect his overthrow. The King, however, remained true to him, and all the conspiracies signally failed. He forgave all the conspirators. He was, as his secretary Morice testifies, "a man that delighted not in revenging". Cranmer was present with Henry VIII when he died. By the will of the King he was nominated one of a council of regency composed of sixteen persons, but he acquiesced in the arrangement by which Somerset became Lord Protector. He officiated at the coronation of Edward VI, and is supposed to have instituted a sinister change in the order of the ceremony, by which the right of the monarch to reign was made to appear to depend upon inheritance alone, without the concurrent consent of the people. But Edward's title had been expressly sanctioned by Act of Parliament, so that there was no more room for election in his case than in that of George I, and the real motive of the changes was to shorten the weary ceremony for the frail child. As long as Henry VIII lived, the Archbishop could promote no significant doctrinal changes. The situation changed with the accession of the young Edward, during whose reign Cranmer shaped the doctrinal and liturgical transformation of the Church of England. He was responsible for much of the first Book of Common Prayer (1549) and compiled the revision of 1552, which contains the most famous examples of his sonorous prose, with the aid of prominent Continental reformers. His Forty-two Articles (1553), though never formally adopted, formed the basis of the Thirty-nine Articles. In 1547 Edward VI granted to the Archbishop for the sum of £429 13s. the rectories of Whatton and Aslacton, with the advowson of the churches, both belonging to Welbeck Abbey. The last great undertaking in which he was employed was the revision of his codification of the canon law, which had been all but completed before the death of Henry. The task was one eminently well suited to his powers, and the execution of it was marked by great skill in definition and arrangement. It never received any authoritative sanction, Edward VI dying before the proclamation establishing it could be made, and it remained unpublished until 1571, when a Latin translation by Dr. Walter Haddon and Sir John Cheke appeared under the title 'Reformatio legum ecclesiasticarum'. It laid down the lawfulness and necessity of persecution to the death for heresy in the most absolute terms; and Cranmer himself condemned Joan Bocher to the flames. But he naturally loathed persecution, and was as tolerant as any in that age. Cranmer stood by the dying bed of Edward as he had stood by that of his father, and he there suffered himself to be persuaded to take a step against his own convictions. He had pledged himself to respect the testamentary disposition of Henry VIII by which the succession devolved upon Mary, and now he violated his oath by signing Edward's 'device' of the crown to Jane Grey. On grounds of policy and morality alike the act was quite indefensible; but it is perhaps some palliation of his perjury that it was committed to satisfy the last urgent wish of a dying man, and that he alone remained true to the 'nine days' Queen' when the others who had with him signed Edward's device deserted her. When Mary came to the throne, Cranmer was in a quandary. He had believed, with a fervor that many people today will find hard to understand, that it is the duty of every Christian to obey the monarch, and that "the powers that be are ordained of God" (Romans 13). As long as the monarch was ordering things that Cranmer thought good, it was easy for Cranmer to believe that the King was sent by God's providence to guide the people in the path of true religion, and that disobedience to the King was disobedience to God. Now Mary was Queen, he was summoned to the council — most of whom had signed the same device — reprimanded for his conduct, and ordered to confine himself to his palace at Lambeth until the Queen's pleasure was known. He refused to follow the advice of his friends and avoid the fate that was clearly impending over him by flight to the continent. Any chance of safety that lay in the friendliness of a strong party in the council was more than nullified by the bitter personal enmity of the Queen, who could not forgive his share in her mother's divorce and her own disgrace. On the 14 Sep 1553 he was sent to the Tower, where Ridley and Latimer were also confined. The immediate occasion of his imprisonment was a strongly worded declaration he had written a few days previously against the mass, the celebration of which, he heard, had been re-established at Canterbury. He had not taken steps to publish this, but by some unknown channel a copy reached the council, and it could not be ignored. Cranmer five times wrote a letter of submission to the Pope and to Roman Catholic doctrines, and four times he tore it up. In the end, he submitted. However, Mary was unwilling to believe that the submission was sincere, and he was ordered to be burned at Oxford on 21 Mar 1556. At the very end, he repudiated his final letter of submission, and announced that he died a Protestant. He said, "I have sinned, in that I signed with my hand what I did not believe with my heart. When the flames are lit, this hand shall be the first to burn". And when the fire was lit around his feet, he leaned forward and held his right hand in the fire until it was charred to a stump. Aside from this, he did not speak or move, except that once he raised his left hand to wipe the sweat from his forehead. See a tetimony of the execution of Archbishop Cranmer by an anonymous bystander. After his death his property passed to his nephew Thomas, and subsequently to Thomas Molyneux, who married Alice Cranmer, daughter and heiress. The son of Thomas Molyneux, a Sir John Molyneux, Bart., sold the estate, and Aslockton and the Cranmer family thus became finally severed. His widow seems to have left England after her husband's execution and there married publisher and preacher Edward Whitechurch (d. 1562). By 1561, they were living in Chamberwell, near Lambeth. After his death, she took possession of the abbey of Kirkstall near Leeds. On 29 Nov 1564, she married Bartholomew Scott of Chamberwell (d. 1600), J.P. for Surrey, but soon realized that he had only married her for her money. She left him, taking refuge with old friends, Reyner Wolfe and his wife, in London, and lawsuits ensued.